Joe Madureira the Creative Studio Director and team has done it again by presenting us with an amazing collection of video game art. Amazon listed the second volume wrongly at 200 pages. It's 224 pages thick, which is thinner than the first artbook The Art of Darksiders. Anyway, The Art of Darksiders 2 art book is still very thick! An astonishing amount of concept art fills the pages. There are character designs, environment concepts, weapons, enemies and 3D renders. And all come with painted version and the sketches. That's a lot to see. There's an incredible amount of variety and detail for all the artwork featured. Towards the end, there's commentary on the style guide and a brief explanation on how they paint over 3D models. The 3D renders are gorgeous but printed a bit small at less than a quarter size for each character. They are considered small only because there's so much detail that you want a larger picture to look at them. The binding has improved. But with a book this thick, I would still be careful. At least, I no longer have the fear of its pages falling out. It's definitely a huge improvement over the the atrocious binding of the first artbook. By they way, the May 2011 second printing of the first artbook has improved the binding also. This is an awesome artbook with a remarkable amount of great art. I´m still not sure about the paperback binding. I have the first book, but the limited, hardcover version. Are you gonna review "Awakening:Art of Halo 4"? I'll review the Halo 4 artbook when I have it. Hi Parka, can you please review the art book released by Feng Zhu Design school? I think it is available in Singapore only.. Yes, I'll review the book. As always excellent review and looksie at the book via video. I hope you're getting these commissions; I just linked to 4 books off your site through Amazon! Yeah, and I'll add my voice to review art of Halo 4 in the next two weeks if possible for an Xmas deadline! Great site. I certainly hope so. Thanks for the support. This has been the most expensive blog I've ever come across. All, yes all. The art books I own is down to my dad showing my this blog! Thank you for all the effort you put into it. 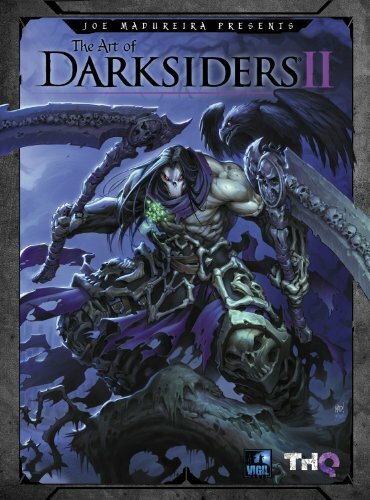 I bought The Art of Darksiders 2 because you had it as one of your favourites of 2012 and it is now one of my fravourste books.